Throughout the month of June, we are doing programs with our corporate partners to promote a month of health & wellness and help employees get “Fit by the Fourth.” One of the challenges during this week is for employees to forgo any fast food & soda for 3 straight days. And to my surprise, this was one of the challenges that got the most attention when we passed out the calendars. So we started to do a little more research on exactly why fast food is bad for you. And while we could write a novel with all of the information available on this topic, we decided to try to keep it short & sweet and stick to the most important points. The bright lights, alluring smells, timely preparation and inviting prices are why fast food chain restaurants have become popular over the years. But the restaurants serve meals that have little nutritional value, and are high fat, high calorie and high in sodium content – all which can lead to a number of health problems. 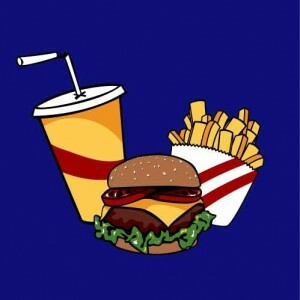 Weight gain, obesity, cardiovascular disease and type II diabetes are among the possible health harms that are associated with regular consumption of fast food. In one year, fast food adds 40 pounds of white bread, 441 pounds of potatoes, 30 pounds of cheese and 77 pounds of fat to the typical American’s diet. Yikes! Not only is fast food associated with high levels of fat, the sodium levels are astronomical. High levels of sodium can lead to hypertension (high blood pressure) and atherosclerosis (damage to the arterial lining of the heart). Sodium can also have negative effects on the renal system, leading to kidney disease. Foods prepared at fast food restaurants are high in sugar content which pushes metabolism into distress. The pancreas will secrete high levels of insulin to counteract the effects of the increased sugar load. High levels of insulin secretion overtime can lead to type II diabetes. The hamburgers, chicken sandwiches, French fries and nuggets do not carry adequate protein and carbohydrate which leaves the body craving sugar due to the drop in blood sugar after consuming fast food. What do you drink when you eat fast food? Soda, right?! It is customary to include soda with the fast food. You may ask: But I drink diet soda, that’s ok, right??? Wrong. Diet soda has the same effects on obesity as regular soda. A research science center at the University of Texas audited 475 adults over a 10 year span. Their finding displayed that those who consumed diet soda had a 70% increase in waist circumference. These adults only consumed 2 diet sodas each day. The aspartame in the soda has caused controversy over the years for: bone mineral health, dizziness, mood swings and heart palpitations. This same study also suggests that aspartame raised blood glucose levels that led to weight gain. If all of that isn’t already enough, fast food carries little nutritional value for the body to use as energy to operate, often leading to fatigue and the inability to complete daily tasks. Anyone still have an appetite? Thanks to Chelsey Aylor for providing content for this article.